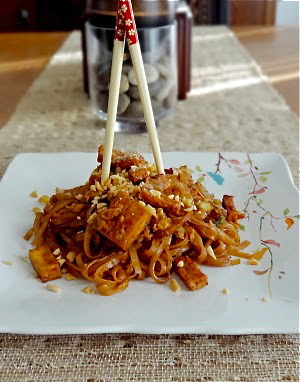 Tofu pad Thai is one of my favorite Thai dish, I often cook at home, I use uncook tofu or store bought fried tofu or soy puffs to cook more easier and faster. add bean sprout and green onion. Don't you think we have similar taste when it comes to food, so I am with you on this tofu pad Thai recipe. Looks very delicious and tempting. Btw, I am already in Vietnam for the pass 3 days and tomorrow heading to Cambodia. Sorry if I am unable to comment on your blog due to time constraint but certainly will esp when the internet connection is found as in certain places, its really bad. I am a sucker for tofu dishes. This looks so very appetizing! Yes indeed,because Asian background :) Have a great time in vietnam and cambodia !! Glad you're recovering nicely. I love pad Thai...so thanks for another yummy version! Glad you're recovering. This dish looks wonderful.